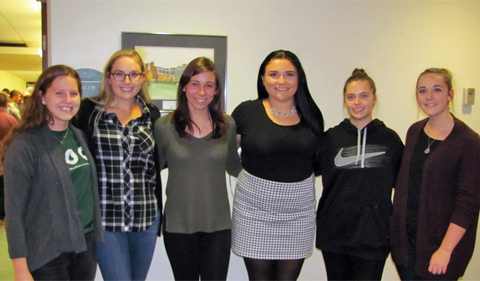 From left: Frances Kokos (vice president), Baily Menefee (PR and social chair), Hannah West (secretary), Jenna Shroyer (president), Gillian Null (community service chair), Rebecca Fouts (treasurer). Once again, the hallway of the Life Sciences Building was abuzz with research conversations on Oct. 17 as Biological Sciences and Biomedical Sciences faculty members and students presented posters based on their research to students in the department. This annual research fair, hosted by Ohio University’s TriBeta (Beta Beta Beta) chapter, provides an opportunity for faculty and student researchers to present their research to undergraduate students who want to become involved in a research lab. TriBeta is the National Biological Sciences Honor Society at Ohio University. TriBeta provides opportunities for undergraduate students to become involved in research and connect with faculty early in their academic careers. Several events are held throughout the year for members to network with Biological Sciences faculty. The two largest events with faculty and TriBeta members are the annual research fair and the faculty dinner. The faculty dinner is an annual event in the spring for Biological Sciences faculty and TriBeta members to meet for dinner at a local restaurant and engage in lively conversations over a good meal. TriBeta, Ohio University’s Xi Phi chapter, also participates in fundraising and service events around the Athens community, with other activities including hikes, social events, and biweekly chapter meetings. Dr. Soichi Tanda, Associate Professor of Biological Sciences, is the faculty adviser.